It was famously dubbed the European power keg, a term deemed appropriate by such strategists as German Chancellor Otto von Bismarck. Such figures feared the imminent release of violence in the Balkans, the sort that just might unravel the grand European plan for armed stability at the start of the Twentieth Century. A light, a spark, and we could call the whole strategic game off. The Korean peninsula is beginning, at least superficially, to resemble such a place, a geographical entity lost in the sound and fury of theatrical nods, prods and incitements. Any ballistic missile you have can be bettered; any military manoeuvre you consider, I can do supremely better. Such nonsense remains costly nonsense in only a monetary sense, till the next mistake, an error induced by mechanical defect or human misjudgement. (Ultimately, all of this is human all too human.) 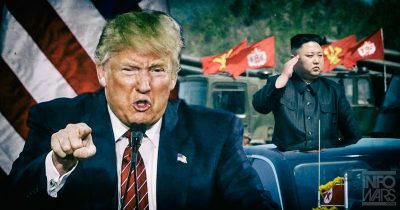 The mechanisms to draw back, to restrain, are not there in the absence of any bilateral connection between Washington and Pyongyang. That hotline remains distinctly chilly. This week’s latest round of demonstrative punches featured a missile launch intended to carry a “large-sized nuclear warhead” over Japan. Kim Jong-un has also made his intentions clear through the DPRK news agency that more testing will take place with the Pacific as a potential theatre of operations. Projectiles overflying Japan are far from new. Pyongyang dared to do so in 1998, 2009, 2012 and 2016. Each time such projectiles were fired, the same reason was cited: they were intended, not as provocative military actions but to deliver satellites. As students of the North Korean theatre make clear, there is nothing too surprising in these aggressive efforts to accelerate the ballistic missile program. Panda, as with some commentators, doesn’t fall for the gruel dished out by such states as Australia and the USA that the Korean despot is mad, bad and dangerous to know. Dangerous and bad, yes, but hardly mad. Each test, he reminds his readers, supplies valuable technical information; each missile venture serves as appropriate, suitably dangerous material to improve the diplomatic position with the United States when these powers reach the negotiating table. The menacing question concerns those pot holes such a project will encounter on route. Given the paltry machinery in place that would defuse a mistake, or its consequences, the big canvass of political engagement should be considered – now. It will certainly put to bed such ramblings as those of Peter Jennings of the Australian Strategic Policy Institute, who sees war on the peninsula as imminent (give it months, he claims), and an anti-ballistic missile system as necessary, even for distant Australia. Such nerve tingling is bound to reverberate well in Pyongyang. There is interest there in dividing the US bloc, keeping Seoul, Tokyo and Canberra concerned that warming Washington’s bed with unequivocal loyalty may be misplaced. This is a true World of Trump, where the self-interested will gain, and where power speaks with deafening volume. In the event that a big canvass approach is taken to this problem, it will have to start with tentative daubs of paint. There are ventures to be made, perhaps a cessation of military tests and operations such as the ongoing Ulchi-Freedom Guardian exercise, a moratorium on testing, followed by grand reassurances about bringing a brash Kim from the cold, where he is doing rather well. Elements of this were considered by Chinese officials in the US-China Diplomatic and Security Dialogue held in Washington on June 21st, advancing the ideas of Chinese Foreign Minister Wang Yi. These entail, first, the suspension of US-South Korean military exercises, traded for a more wishful suspension of North Korean testing and missile development. China would hold the financial strings by keeping an eye on Pyongyang’s compliance. The grand reassurance, those steps that will ultimately lead to throwing water rather than fire on the powder keg, must, ultimately, come from the United States. Sovereignty and duration are the two factors that matter to the North Korean regime. Doing so would also reassure a terrified Japan, a state which has spent much in acquiring sea-based interceptors, be it the Patriot Advanced Capability-3 system, and the Standard Missile-3 Aegis. The population, meanwhile, is boning up on evacuation drills and a defence budget with increased funding for anti-ballistic missile defences. Any united front from Washington cannot, at present, be expected. The visionaries are not so much confused as suffering from poor sight. While Trump may well hector from the platform of Twitter, what matters, ultimately, is that uncomfortable chat with Kim Jong-un. For that reason, even such figures as Secretary of Defence James Mattis are keeping the diplomatic avenue open. (Not such a Mad Dog is Mattis these days.) It is an avenue that will have to be taken before the lunatic fringes seize the centre stage.